Rice being the staple food of the southern part of India, is consumed with various gravies or kuzhambus to go with it. Idlis, dosais, uppumas, idiyappam, aappam, pongal are some of the breakfast and dinner preparations. But, lunch is always rice. Some or many households might have rice for dinner too. The traditional tamil meal is called ‘Sappadu’. Sappadu means a complete minimim three course meal with rice and curries. ‘Virundhu’ is a feast on special occasions laid for guests, many years ago on the floor but nowadays on tables and chairs but always on Vaazhai Ilai/banana leaf. Vaazhai is Banana. Ilai means leaf in tamil and hence the virundhu sappadu or the feast meal is also called ‘ilai sappadu’. 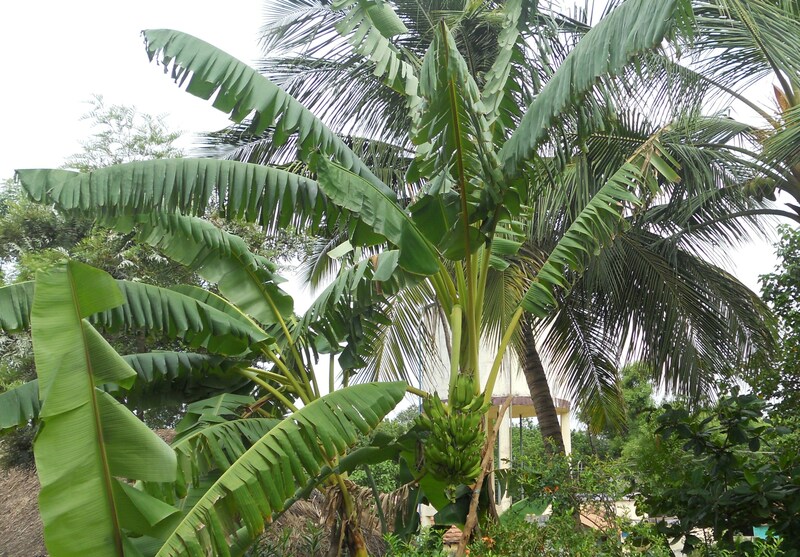 Most of the houses in villages and towns and some in the city would have banana plant in the garden. Before every meal, the suitable leaves are cut, washed and laid for breakfast, lunch or dinner. Steel plates are also commonly used. A lavish feast would have the five main courses below in part I, accompanied by one or more of the part II varieties. When the banana leaf is laid, the first item to go on it after wash is salt. Salt symbolises gratitude. ‘uppittavarai ullalavum ninai’ is a very old tamil saying- which means – always remember the person who offered you food. The order at which each of the vegetable items are placed on the leaf after salt is a ritual in itself – mostly unfamiliar to the younger generation. After salt and vegetables, Paruppu or Dal is already served on the leaf before rice arrives. 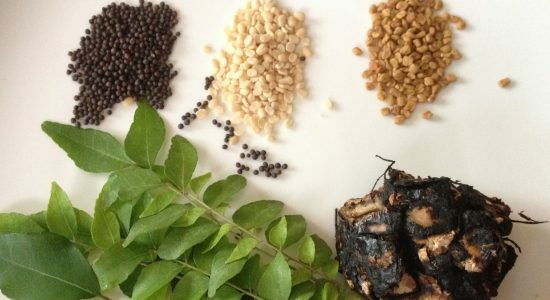 Rice is first had with Thaalicha Paruppu which is seasoned lentil – generally thuvar dal/red gram/pigeon pea seasoned with mustard seeds, urad dal, cumin seeds and green chillies. Sambar – is a combination of lentil and vegetables prepared with a special curry powder prepared traditionally by evey household. Kuzhambu – can be any gravy. Even sambar is a kuzhambu. But on a feast platter – generally a spicy, tangy tamarind based curry with specially ground spices called puli kuzhambu, vatral kuzhambu or kara kuzhambu is served. Rasam is a thin soup not used as an appetiser as popularized outside the south of India and abroad, but is a digestive soup. After Rasam comes the dessert. There is already a sweet – for example poli, laddu or badushah kept initially on the banana leaf; payasam or the sweet pudding/kheer comes after rasam and before curds/yoghurt. Nowadays, payasams are often kept in a small pudding bowl, so that one can have it anytime inbetween the meal to counter the spices or generally at the end. Traditionally, payasam is poured on the banana leaf.. In tirunelveli feasts, I have enjoyed payasam with a sprinkle of sweet boondhi and appalam. This is a rare but different combination, stimulating the taste buds with mildly sweet payasam, very sweet boondhi and salted appalam! Rolling your hands in the banana leaf to pick up enough payasam to send inside the mouth is an intricate, complicated task but a very interesting one. One would have already had this practice with rice and rasam – which comes before payasam – trying to hold the edge of the banana leaf so that the liquidy rasam doesn’t flow on the lap!! Last comes rice and thayir – curds or buttermilk. Curds or yoghurt rice is had with pickle and another exclusive combination for curd rice – more milagai. ‘More’ in tamil means buttermilk. Green chillies soaked in buttermilk, then dried in the sun and stored in bottles. More milagai is prepared by a long process, but available in super markets easily. To serve more milagai, it is fried in oil and made crisp and these are had with curd rice. In a normal household, every lunch meal would constitute rice with sambar, rasam and curds with a minimum of one kootu and one poriyal, appalam to go with sambar and rasam, oorukai/pickle mostly a must for curd rice. Appalam and oorukai have become restricted due to health factors. But due to dietary and practical reasons – lesser intake of food, lesser intake of rice products and lesser time to spend in kitchen – the spread varies with each family. I read an interesting article of a banana leaf meal or ilai sappadu experience in http://agelessbonding.blogspot.com/2010/06/elai-saapadu-experience.html. Previous Post Poli – a different story! Next Post Quick and Easy Thaalicha Paruppu/Seasoned Lentil! I wish you taught us how our ancestors ate whole grains on a daily basis and foods made with unrefined ingredients as an alternative to refined ones. Whenever everyone is feasting I sadly sit on the side unable to have anything because it is all refined. Celebrations are never enjoyable for me. Please also teach us how to be vegetarian without nutritional deficiencies especially for girls in need of iron and full and complete protein, which we often lack. Thanks for sharing your thoughts. Indeed, we seldom find anything unrefined on a feast platter. Shall certainly try to give more inputs on your suggestions.